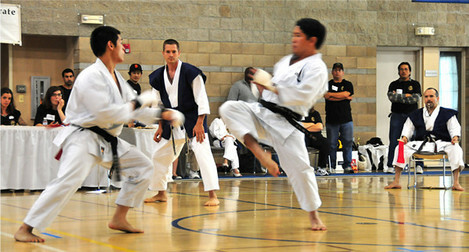 Sensei Keeling is the author of over 100 articles on various aspects of karate. He is the moderator of several online karate forums, is Chief Referee for the thrice-yearly Shinkyu Shotokan tournaments in South San Francisco and frequently runs or participates in various karate special events in the area. In addition to karate he has fairly significant experience training in aikido and boxing, and has had exposure to (=limited training in) judo, jujutsu, Muay Thai, kickboxing, Krav Maga, several weapons arts and other karate styles. Sensei Keeling has been one of the senior instructors selected to teach at the WTKO International Summer Camps in 2012, 2014, 2016 and 2018. He has taught in seven countries on three continents. 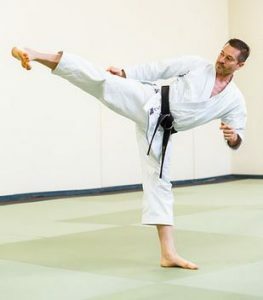 He also heads the Organizing Committee for the Shotokan Legacy Seminars, an unparalleled series of international training camps and teaches specialized self-defense workshops and has brought in dozens of guest instructors to the dojo. Sensei Keeling is also the Director for the WTKO’s National Technical Committee. Sensei Keeling has won or placed in many tournaments, including qualifying to represent Tokyo in the JKA All-Japan tournament a total of four times by finishing among the top eight competitors in the All-Tokyo tournament. 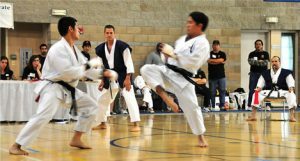 Although he is certainly able to train students to excel in tournament competition, he considers tournaments to be far less important than training for self-defense and self-betterment. That said, Sensei Keeling is often seen leading judging/referee efforts at various tournaments in the area and acts as Chief Referee at a minimum of three tournaments/year and often several more. In addition to teaching most of the classes at SVSK, Sensei Keeling also teaches after-school classes at local elementary schools and is a Lecturer at San Jose State University — their official karate instructor, teaching beginning and intermediate karate classes for credit. He teaches children at day-camps during the summer and also conducts private lessons and self-defense seminars at corporations, schools and private events. Mr. Keeling holds a Masters degree in Kinesiology and received certification as a personal trainer from NASM. He is constantly working to further enhance his already deep knowledge of physical movement and related subjects. He worked in the investment/financial services business for approximately 20 years in various capacities before leaving the corporate world at the end of 2012 to devote all of his time to karate and self-defense. Mr. Keeling has a wonderful wife and 3 children, all of who have taken classes with him in the past but have their own interests as well. 🙂 Read an interview with Sensei Keeling from 2007 or another one from 2014, in The Shotokan Way.